This beautiful cafe-bar is located on one of the most picturesque neighboorhoods of Athens, Mets, and next to the first cemetery of Athens, where some really famous personalities like Demis Roussos and Melina Mercouri are resting in peace. Kain is open from 10:00 in the morning with coffee, sandwiches, other small snacks, great wifi connection and a peaceful environment which makes it perfect for reading a book or getting some work done. From 19:00 you can order pizza and salads from the nearby Colibri restaurant and enjoy a drink in reasonable prices (6 euros for long drinks and 3-5 euros for beers). Kain also has a very special cocktail menu which is worth a try. I like this spot for its interior, the music and the people. 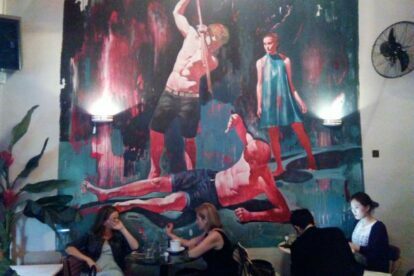 The space is characterised by the Art Deco elements mixed with contemporary architecture and the very impressive mural of the artist Dimitris Taxis, depicting the biblical Kain’s murder of Abel. The music is carefully selected with regular DJ sets while this spot gathers the youth of the area as well as other noticeable faces. My favorite time to go there is on a Sunday afternoon, right after a walk at the nearby National Gardens.